Like many members of our local theatre tribe, I often wonder how I, too, can be more involved. In spite of the fact that I’ve personally seen the local theatre scene from nearly every conceivable angle, these days it’s very rare to see me as part of a closed-door meeting deciding the future of a company’s artistic direction. I’m not likely to appear in a room full of investors in an attempt to have them empty their coffers for an additional year. And my opinion about a play isn’t likely to have any bearing on the next year’s major theatre awards ceremonies. So although I have an active role in the Bay Area theatre community, I still feel uninvolved in regard to the unseen goings-on that take place and shape what I see on each of these stages. This lack of involvement is both hierarchal and – as with most things – financial: I usually just can’t afford to attend events in which these things take place, and on the rare occasion I can, there’s usually a scheduling conflict. 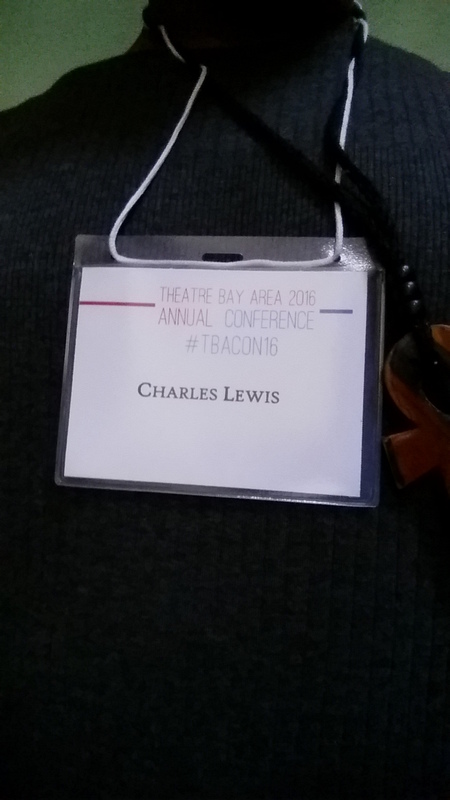 So when Dale Albright of Theatre Bay Area offered me the opportunity to lead a session at this year’s annual TBA Conference, I gladly accepted. Not only would I be rubbing elbows with some of the biggest movers and shakers of the most important theatre scene on the West Coast, but I’d be getting in for free – a price I can always afford! 9am-ish: Despite BART coming dangerously close to make me late, I showed up to the Berkeley Rep in time for the registration and to get my nametag (above). Sure, my doesn’t have any special titles, but it’s the same name that appears inside the program for my session, so I ain’t complainin’. 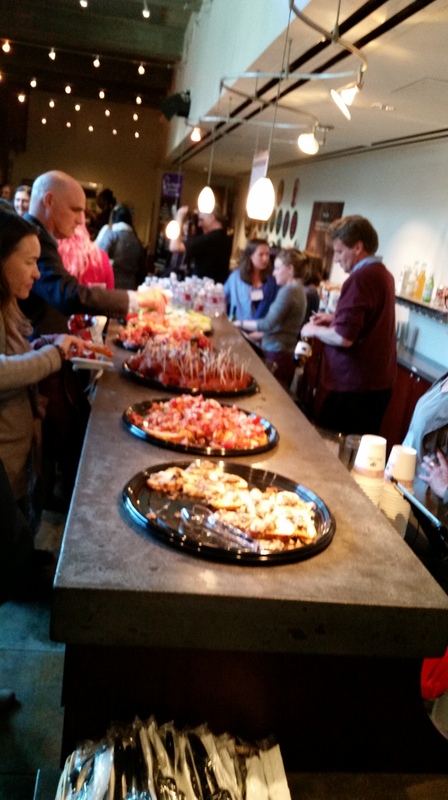 I see lots of familiar faces, some I’ve never seen before, and – most importantly – free bagels and orange juice. I avail myself of the latter before heading into the theatre. 9:30am: I find a seat up front (I tend to sit in the “splash zone”), which happens to be right in front of the cool kids from The Breadbox Theatre. After a few words from Brad Erickson, we get our keynote speech from Diane Rodriguez of Center Theatre Group. For the most part, it’s a touching speech about evolving theatre that goes over pretty well… until she rails against theatres that still put on Shakespeare. Hoo-boy, did she pick the wrong room. This sentiment is still in the air when the first Q&A question isn’t a question at all – the artistic director of Marin Shakes voices her disapproval at the comment. “Don’t make Shakespeare the enemy!” she says to a thunderous applause. It’s just after 10:30 and things have already gotten heated. 1:15pm: Lunch. After cleaning the room, I walk around the block to a little sandwich place and chat with one of the ladies of PianoFight’s Chardonnay Comedy. My official responsibilities are over, now I’m just here to observe. 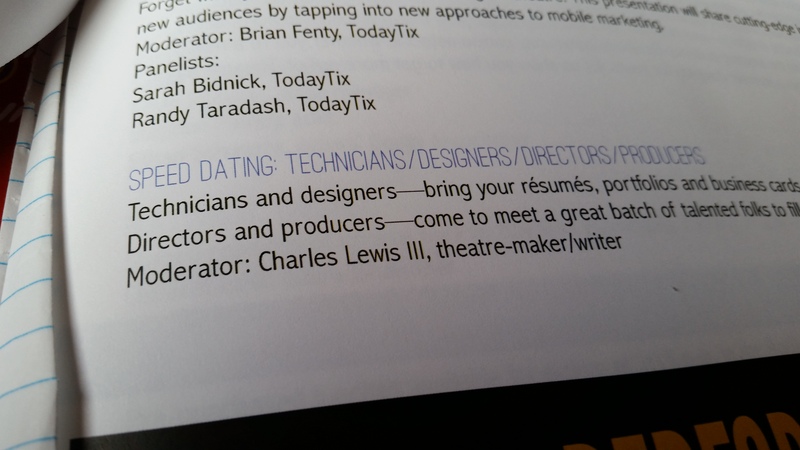 2:15pm: Leading with Trust to Build an Audience: Cultivating Patron Relationships longer than a One-Night Stand. That mouthful of a title was my next panel. The goal was to figure out how to get “normal people” to see more theatre. In the panelists’ research, they found that most people have usually seen just one play, didn’t like it, then never attended theatre again. Why does that seem unique to theatre when people will see hundreds of bad films or continue to support sports teams after they lose? Although I wasn’t a fan of some of their suggestions (I’m still VERY anti-Tweet seats), the idea of engaging with high schools and colleges intrigued me. 3:30pm: We’re back in the main theatre for one final panel/Q&A about inclusivity, incidentally featuring many of the speakers from the earlier panel on that very subject. After that, a scene is acted out from Lauren Yee’s in a word, right before Yee herself receives this year’s Will Glickman Award for the play. This is followed by a moving tribute to SF Chronicle theatre critic Rob Hurwitt, who will be retiring this year after 40+ years of service. Then we make it back to the lobby chat, drink, and stuff our faces. So that was my first TBAcon. I met a lot of people, heard lots of interesting stories, and remembered what I do and don’t like about theatre. I’m glad I accepted Dale’s offer to help out; I’d most likely do it again, integrating the knowledge I didn’t have before to make for a more effective session. Most of all, I now know that the purpose of these gatherings is to find out why folks like me aren’t part of them to begin with. Both sides have the same goal, yet find it just out of reach. I don’t know the definitive answer to that question, but I appreciate being part of the conversation. Charles Lewis III is a writer, director, actor, and all-around theatre artist whose name tag was pretty bare because there was too much to add. This entry was posted in In For A Penny and tagged American theatre, Bay Area theatre, Charles Lewis III, Diversity, In For A Penny, independent theatre, indie theatre, intersectionality, TBAcon16, Theatre Bay Area. In which I attend my first TBAcon to take part in larger discussions about theatre.